Born on our Wedding Anniversary. Labour was quick but intense and she was out in two pushes, mind you, the first push contraction went for over three minutes and her head was out and she was crying before the rest of her could be pushed out! She looks so much like Luke did when he was born, except she has dark hair, and well, she has hair, the other two were bald! Ok, back to bed for me for some more sleep! Whoppeeee!!! She has arrived. Congratulations Beth - what a job well done. She is just lovely and her name is beautiful too. Okay I don't know you, just passing through other people's blogs, doing some reading, and MY GOODNESS!!!! How could I not stop (being a mommy) myself and tell you congratulations on what a beautiful little girl you have. She's just lovely. Now go back to bed and get some sleep! :) You're gonna need it LOL. Congrats Beth! Such an adorable little girl. Beautiful name too. Catch up soon. Thinking of you all and hope your enjoying everymoment together with your new family member. Well done! CONGRATULATIONS to you all Beth (but mostly to you because you had to go through the whole thing!). Kylie told me in an email that you had had Amy, and I was hoping you would put a photo up for us. She is just pure heaven. whats with all the she's? i'm sorry. Amy is beautiful, I still can't believe Amy is here and can't wait to meet Amy very very soon! Congratulations beautiful girl. You have a great Mum and she's going to have a ball scrapping in PINK!! WEll done Beth!! 2 pushes.....not bad. Take care. She's adorable Beth! Congrats to you and a big welcome to Amy. Thanks for sharing the gorgeous photo. 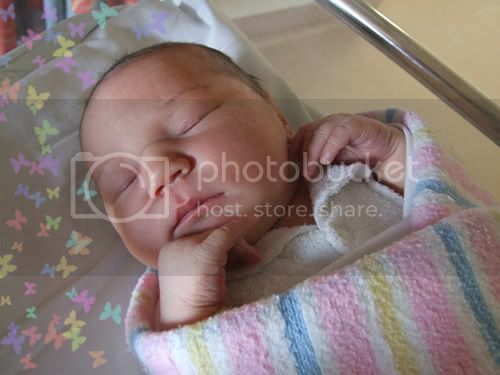 Congrats Beth, so glad to here that you had a good labour. your little possum is gorgeous. Was so happy for you when I heard the news. So glad she is here safe and sound and that you are both ok.
Take care of yourself and welcome Amy. congrats to you and your family, I loev the name too!!! Congratulations to you and your family Beth, Amy is just beatiful! Glad everything went well for you. Take care of yourself! Congratulations Beth, Steve, Kate and Luke. Amy is gorgoeus, can't wait to see more of her. Congratulations! She is gorgeous.... Thanks for letting us know, been waiting patiently for the news. Glad it was a quick labour. Take Care and getting plenty of rest. Hello precious Amy!!!! You are adorable and can't wait to meet you! As for you guys - way to go peoples!!!!!! Beth, Steve, Kate and Luke - all our love to you guys as you spend beautiful time getting to know your precious bundle of joy and life! Big Congrats She is just beautiful. Yay Beth she's here!! CONGRATULATIONS!! What a cutie patootie little Miss Amy is! Love and blessings to you and your very precious family. Congrats Beth .. she is adorable! Well I am VERY impressed anyways. Congratulations to you and your family, she really is adorable!